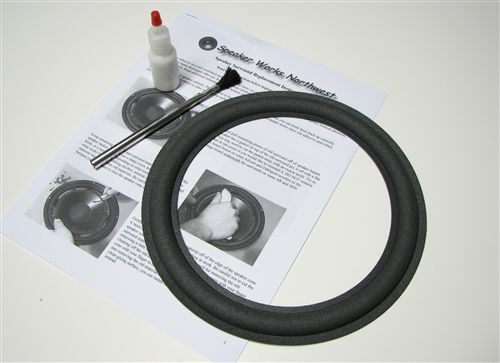 9" Smaller Advent Flat Speaker Repair Kit For Replacing Foam Surrounds. Fits Smaller Advent 9" flat attach woofer with a speaker cone OD of 7". Most Advents use standard 10" surrounds. Kit to repair one 9 inch speaker. Comes with 1 surround, instructions, speaker adhesive, applicator brush, and phone or email technical support. Works on flat attach speaker cones. Speaker Cone Outside Diameter 7"
We offer quantity discounts on purchases of more then one speaker repair kit which will be automatically calculated in the shopping cart. Note that we will only send one set of instructions per order. We will usually combine the adhesive into fewer large containers for quantity orders. My first attempt at loudspeaker repair was very satisfying with the products and staightforward directions provided with my order. My 1973 vintage Advent speakers sound great again.